Celebrate Cycling with Squij Kat's products. Fun, functional products that will make you rush to get home after a ride. 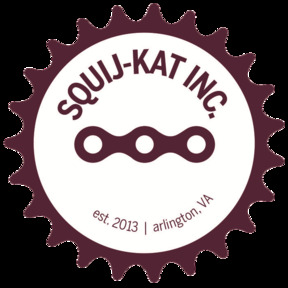 Squij Kat was founded by two female cycling enthusiasts in Arlington, Va. Our love of cycling includes commuting to work, competing in triathlons, and aimlessly tooling around the neighborhood. During the summer of 2013, we spent many nights sipping wine and brainstorming cool products that we could make from bike parts. Though most of our ideas were forgotten by the next morning, one very necessary and clever creation stuck! Wine Links, our bicycle chain wine charms were an instant hit among cycling fanatics and wine aficionados. In 2014 we incorporated and we continue to create successful products including stenciled doormats, puzzles and bicycle-chain bracelets. So, whether you're a daily bike commuter or a velodrome track racer, Celebrate Cycling with Squij Kat products! Our personally-designed items make great gifts for your bicycling buddies. All products are fun, yet functional. It’s everything you need while you’re not on your bike! Our passion for biking goes beyond sport and leisure. We recently became certified with the League of American Bicyclists to teach traffic skills and bike safety classes. In 2016, Squij Kat opened an education service area. Please contact us if you are interested in taking a class! We proudly support our local biking community and a portion of our sales are donated to Fairfax Advocates for Better Bicycling (FABB).